Every wedding photographers goal is to make someone relive the feeling they had during their wedding. This photograph is an example of such a feel – the focus in pinpointed on Kate’s glance and absolutely I love the subtle tear in her eye. It’s always a pleasure to work on our gallery art prints – master printing at it’s full potential. I am working on a few wedding edits and albums designs and I had to take a break to create – one print with my ideas. 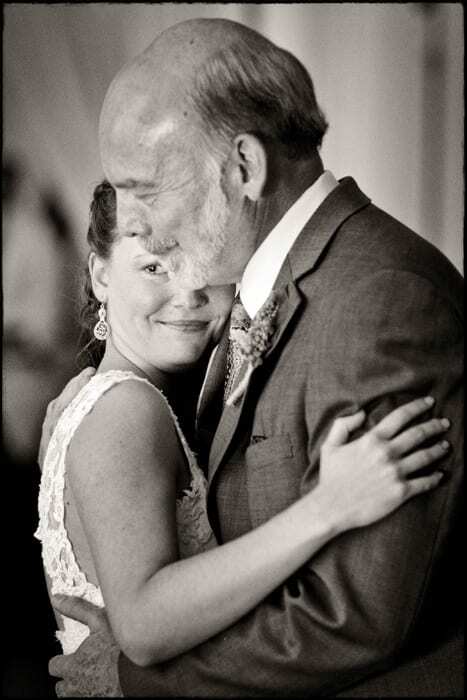 This image was from a recent wedding at Veritas Vineyards and shows a Kate and her father dancing. I love shooting with available light and then taking the time with an image to deliver an fine art print with my own personal touch. Maximizing the natural look and feel of the day with a subtle bokeh from the fastest of lenses is what brings me back again and again. From a technical standpoint, these images can be difficult to make – as the focus must be one hundred percent accurate with no room for error. If you are an inch off, the image is soft. However, when you nail the image, the results are like no other.